As they change, they create a picture of the impact of global warming that can help scientists find solutions. The landscape also plays a key role in climate change by storing carbon so it is not released into the atmosphere. But just how the processes link together, and how plants and soils respond to global warming, remains unclear. NERC is funding research to find out how land and sea could be managed to safeguard its carbon stores, as well as the people and wildlife relying on it for survival. 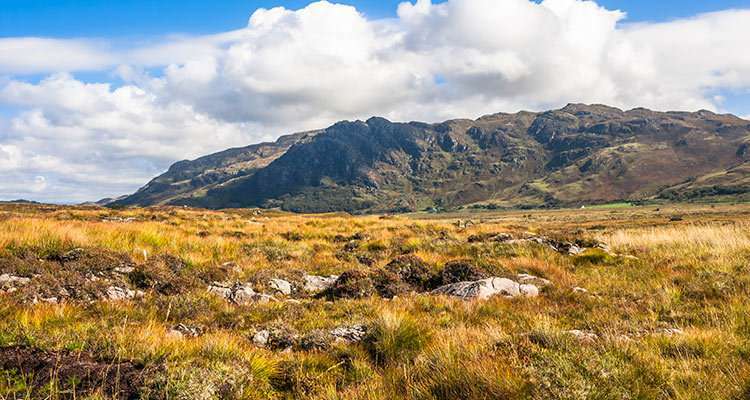 In Wales, experts at NERC's Centre for Ecology & Hydrology (CEH) have spent nearly 20 years improving our understanding of the impact of reduced rain and raised temperatures on upland heath and peatland traditionally used for hill farming. The work involves using rain and light sensors to activate plastic 'curtains' on a set of experimental plots of land on the hillside to manipulate soil moisture and heat. They've found that, in plots where they created conditions mimicking drought, the soil lost up to 10% more carbon. The results suggest that climate change can be a vicious circle. As global warming causes more extreme dry spells, the soil's ability to store carbon gets reduced. That in turn can lead to even more carbon being released into the atmosphere and so more warming. When soils are water-logged, organisms such as microbes and fungi, and also plant roots, are less active so they release less carbon in the form of carbon dioxide and other greenhouse gases. When soil dries out, and stays dry, these processes speed up and they release more carbon. Our experimentally-dried plots are now permanently dry, losing carbon all year round. Another key finding from the ongoing work was that soils warmed at night lost less carbon than expected. The team put that down to a surprising amount of moss which grew on the soil surface. It seems to have prevented soil from drying out, which then reduced carbon emissions. Sabine added: "That was not what we were expecting because warming also causes soil to dry out. We don't really know what the moss is doing to the soil's properties so we're hoping a Ph.D. student can look into that further." The important point is that whatever land management does to peatland soils to keep the soil carbon locked away, we need to manage the soil water cleverly. In Scotland, NERC is also funding work to find out how peat bogs store carbon to improve multi-million pound restoration work by governments. Peatland here currently holds more than 1·6 billion tonnes of carbon but it is being lost due to damage caused mainly by the forestry sector. If we can understand what makes peatlands tick, we can help to keep them carrying out vital ecological services, including carbon capture. Last but not least is the seabed, which research has found plays a significant role in storing carbon long-term. New ways of analysing the content of sediments up to 70m deep in Scottish sea lochs have allowed experts to make the first scientific estimates of the amount of carbon held in the mud. That amount, some 640 million tonnes, is roughly three times less than that stored in Scotland's peatlands. But, as the fjords cover a far smaller area than peatland—at just 1,221km2 compared to 17,270km2—they are a far more efficient carbon store. Though these important coastal and marine carbon stores are no longer forgotten, this is just the first step to truly understanding carbon in the coastal ocean and how it fits into the global carbon cycle.